More crap news today. Jorge Soler who was on the disabled list for a couple weeks hasn’t returned to the Daytona lineup yet, but has been available to do so. We now know why, Soler has a stress fracture in his left tibia, shoot. Soler will be in a walking boot for 4-6 weeks, and could miss the rest of the season per reports. So much for seeing him play in the futures game during all-star weekend, shoot times two! 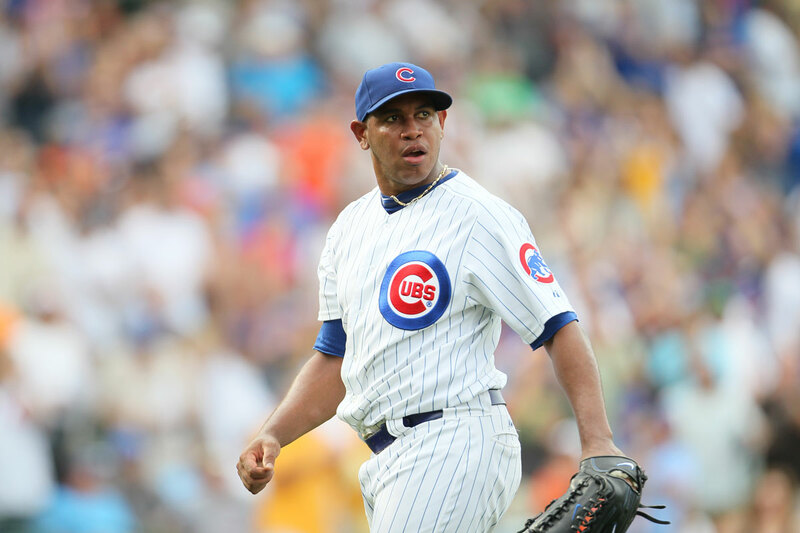 The Cubs finally pulled the trigger today and designated Carlos Marmol for assignment. The corresponding roster move is Brian Bogusevic getting called up to the Cubs. The writing has been on the wall for quite some time for Marmol as he has been in a steady decline for a number of years. Briefly it looked like Marmol captured the success he once enjoyed again during the second half of last season, but it never showed up this year. The Cubs reached a point where they couldn’t use him, that’s saying a lot given the success or lack thereof this season. The constant control problems, and lack of mental toughness was a dangerous mix for Marmol and now he is paying for it by being removed from the 40 man roster. This is an unfortunate end to the Marmol saga for the Cubs as they couldn’t get anything for Marmol, it looked like they had acquired Dan Haren in the off-season for him but the Cubs backed out because of Haren’s medical reports. Pierce Johnson promoted to Daytona! Great news today for Cubs top pitching prospect Pierce Johnson as he was promoted today from Class A Kane County to High A Daytona. Johnson earned every bit of this promotion, the 2012 first round pick (supplemental, 43rd overall) was 5-5 with a 3.10 ERA in 13 starts with the Cougars. 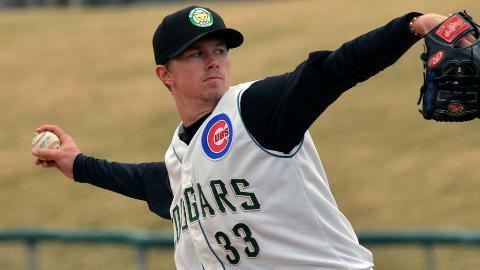 Johnson is moving fast, in his first half season in the Cubs organization he pitched for the AZL Cubs, and for the Boise Hawks. He started 2013 with Kane County and now is making the jump to Daytona, that’s four levels in just about a calendar year, the future is very bright for Pierce Johnson, congrats! Author bornonthirdcubsPosted on June 20, 2013 Categories 2013 Minor Leagues, Daytona Cubs (High A) 2013, Kane County Cougars (A) 2013Tags AZL Cubs, Boise Hawks, Cubs 2012 Draft Pick Pierce Johnson, Kane County Cougars, Pierce Johnson promoted to Daytona Cubs, Pierce Johnson statsLeave a comment on Pierce Johnson promoted to Daytona! At The Plate – Runs came early and often in this one as Iowa held a 6-5 lead after five innings, they added an insurance run, which they would need en route to a 7-6 victory of Oklahoma City. Solid offensive day for Iowa as eight of the nine guys in the starting lineup had at least one hit and the Cubs were 4-for-8 with runners in scoring position. Logan Watkins was solid out of the leadoff spot going 2-for-5 with a double, and two RBI’s. Brad Nelson had a huge day going 2-for-4 with two home runs, two RBI’s, and two runs scored. All Junior Lake has done since coming back from injury is hit, he was 1-for-5 with his fifth double of the season, and two runs scored. Ian Stewart has found some magic at the plate as of late, he was 1-for-3 in this one with a double, a walk, an RBI, and two runs scored. On The Mound – Yoanner Negrin is still getting stretched out as he makes his transition from the bullpen to the starting rotation; he made his third start of the season last night. Negrin worked five innings giving up five runs on ten hits while walking two and striking out eight, he earned his first win of the season. Casey Coleman continued his brilliance of the pen as he worked three scoreless innings giving up two hits while walking one and striking out two. Brian Schlitter worked a rocky ninth as he gave up one run on two hits while striking out one to earn his second save of the season. At The Plate – Tough loss for Tennessee as they let a 3-0 lead get away in the sixth inning, and wound up losing 4-3 in walk off fashion in the ninth. Arismendy Alcantara continued his stellar 2013 as he went 2-for-4 with a run scored, he’s now hitting .290 on the season. Christian Villanueva also was 2-for-4 with a run scored, unfortunately the Smokies could do nothing with runners in scoring position going 1-for-8. Rafael Lopez had a solid game going 2-for-4 with two doubles, that gives him fourteen on the season, he also had a run scored in the loss. On The Mound – A.J. Morris got the start for the Smokies and was outstanding going 5.1 innings giving up one run on two hits while striking out four. Zach Rosscup is usually reliable, he was knocked around however as he worked one inning giving up two runs on two hits while walking one and striking out one. Trey McNutt is starting to turn things around, he was solid going 1.2 scoreless innings giving up one hit and striking out two. Kevin Rhoderick continued to struggle and got the loss, he worked two-thirds of an inning giving up one run on one hit while walking one and striking out one. At The Plate – Javier Baez, that’s all you need to know. These types of games don’t come around too often, in fact what Baez did was only the second time that it has been done in the 94 year history of the Florida State League. Baez was 4-for-4 with FOUR home runs (FOUR! ), seven RBI’s (SEVEN), and four runs scored, have a day, kid. 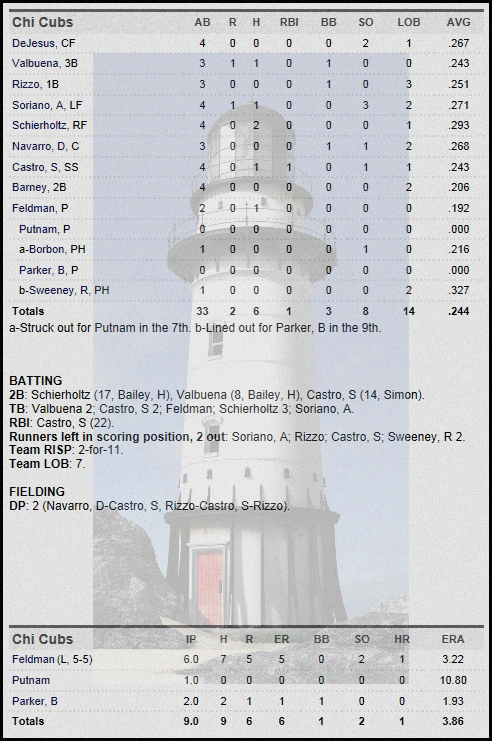 The huge night makes Baez’s numbers for the season look that much better, he’s hitting .291 with thirteen homers, and forty-four RBI’s, in a pitchers league. Wow. On The Mound – Rough go of it for Zach Cates, but he did give Daytona some innings, and picked up his sixth win of the season. Cates worked six innings giving up four runs, three earned, on seven hits while striking out six. Luis Liria was knocked around out of the pen as he worked one inning giving up two runs on two hits while walking three (Not Good), and striking out two. Larry Suarez was tremendous out of the pen going 1.1 scoreless innings giving up one hit while walking one. Frank Del Valle worked the final two-thirds of an inning to pick up his fourth save of the year, he walked one and struck out two in the process. At The Plate – Nothing going right for Kane County lately, and last night was no exception as they fell to Cedar Rapids 6-2. The Cougars could only manage two runs on six hits, but did walk four times, unfortunately they were 0-for-11 with runners in scoring position. Albert Almora was 1-for-4 in the loss with his seventh double of the season, he is now hitting .423 for the year. Rock Shoulders found some hits last night, he was 2-for-4 with his twelfth double of the season, and a run scored. Oliver Zapata was 2-for-3 with a run scored, he now has his average up to .270 on the season. On The Mound – Pierce Johnson got the start and had one of his worst outings of 2013 as he suffered his fifth loss of the season. Johnson worked 4.2 innings giving up five runs on seven hits while walking two and striking out four. Lendy Castillo took over and did a solid job of keeping the Cougars in it, he worked 3.1 innings giving up one run on three hits while striking out four. 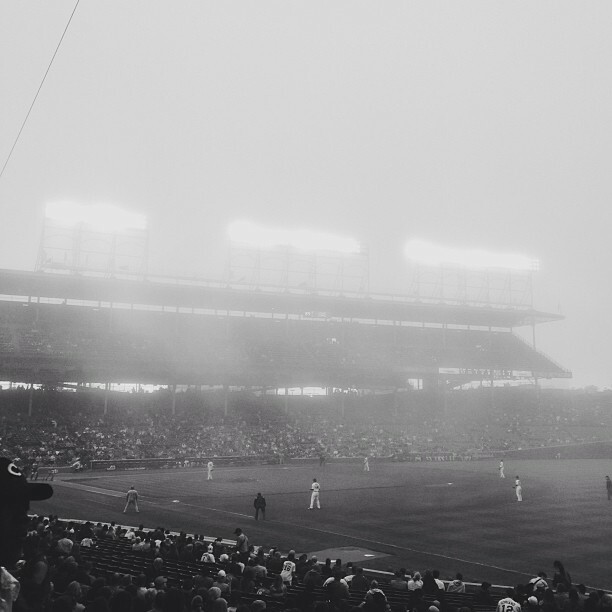 Cubs lose, but hey, fog! Some games just lack interest, this was one of them, unless you are a huge fan of lake enhanced fog, and who isn’t?? The only thing that would have been better is if Cheryl Scott was there to tell us about it. It was a foggy mess at Wrigley and the Cubs followed suit as they lost to Brandon Phillips 6-2, that’s right, Brandon Phillips drove in all six runs, the guys a jerk. One bad inning did Scott Feldman in, and the Cubs probably couldn’t see the ball, home field fog is supposed to help the home team! Author bornonthirdcubsPosted on June 10, 2013 June 10, 2013 Categories 2013 Regular SeasonTags Brandon Phillips 6 RBI, Cheryl Scott, Cubs 6/10 Box Score, Cubs 6/10 Game Highlights, Cubs 6/10 game recap, Fog at Wrigley Field, Homer Bailey, Reds 6/10 Box Score, Reds 6/10 Game Highlights, Scott FeldmanLeave a comment on Cubs lose, but hey, fog! FOUR home runs. FOUR. Javier Baez is 4-for-4 with four home runs, seven RBI’s, and it’s only been seven innings. Obviously I will have more on the amazing night that Baez is having during the minor league recap post. I’ll keep you updated as he might get another at bat if Daytona scores a few more runs. Second player in the 94 year history of the FSL, the other guy?? Ryan Harvey…. oops. Here’s video via the Daytona Cubs Facebook page of the 4th HR. Oh offense, are you there?? If so, can you please show up today, thanks. The Cubs have been absolutely shut down the last two days by the Pirates pitching, first by Francisco Liriano, then yesterday by A.J. Burnett. Today the Cubs will tasked with solving Jeff Locke who has been outstanding for the Pirates. The Cubs will counter with Edwin Jackson who has been anything but outstanding for the Cubs, first pitch is scheduled for 1:20 PM CST, there is a threat of rain, but should be dry until after the game.